Since eating at Rick Bayless’s Xoco Restaurant in Chicago earlier this year I’ve been trying out a few of his recipes. This one is from his Mexican Everyday cookbook. 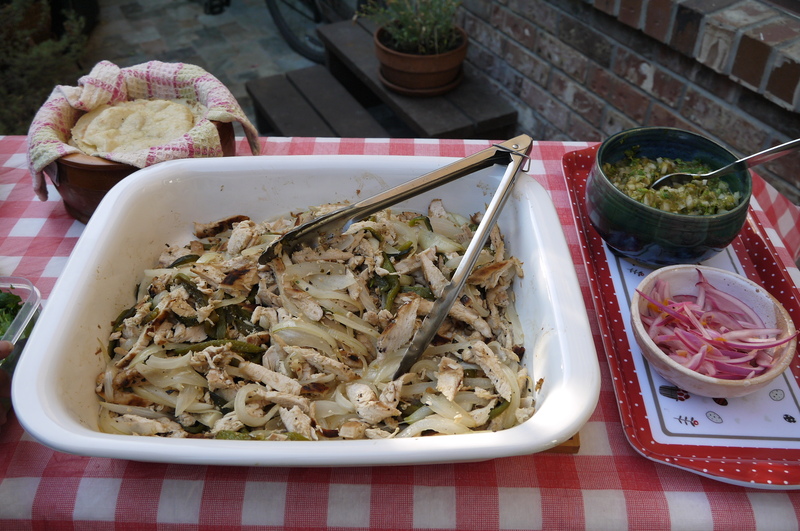 It was delicious with chicken tacos, especially for lovers of heat it their salsa. If you tend to shy away from heat you can either use less of the hot pepper, or serve it with some sour cream or plain yogurt to temper the heat. I really liked this salsa, but in the future I would likely go back to my usual method of roasting over a flame. I think I prefer that kind of char on the tomatillos. This is also good over scrambled eggs! Place a cast-iron or non-stick pan over medium-high heat. Lay the tomatillos in the pan cut-side down, then add the garlic cloves. 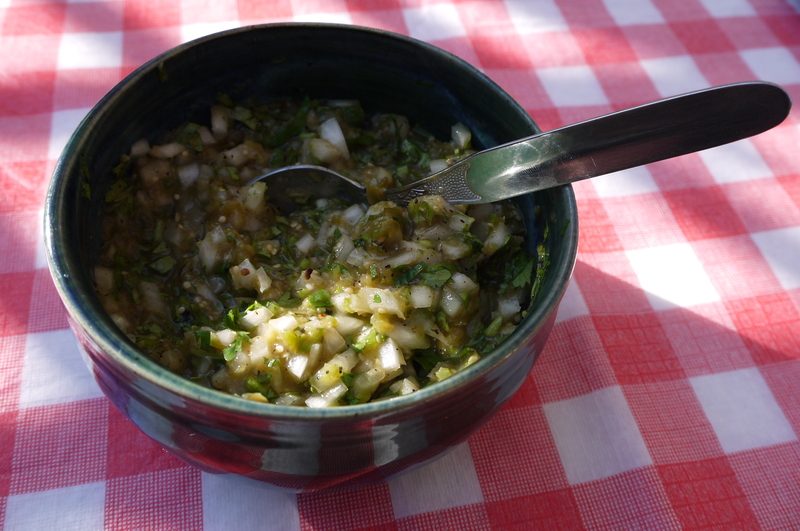 After about 3-4 minutes, when the tomatillos are browned, turn them and the garlic over to brown the other side. At this point the tomatillos should be very soft. Scrape the contents of the pan into a blender and let it cool to room temperature. Add the chiles, cilantro (do not add the cilantro if you won’t be serving right away) and 1/4 cup of water. Blend until coarsely pureed. Rinse the onion then strain it. Stir into the salsa and add salt to taste, about 1/2 teaspoon. If you are not going to serve this right away it is best to wait to add the onion and cilantro until shortly before you serve it.